The E-FUSO electric heavy goods vehicle is being showcased at the Tokyo motor show to demonstrate electrification is possible for heavy duty trucks. Daimler’s Mitsubishi Fuso Truck and Bus division (MFTBC) has strengthened its commitment towards alternative drivetrains with the announcement at the Tokyo Motor Show that it will electrify its complete range of trucks and buses in forthcoming years. At the event, MFTBC unveiled E-FUSO as the first OEM to launch a product brand exclusively dedicated to electric mobility of trucks and buses. As further proof of this strategic move, MFTBC celebrated the world-premiere of its all-electric heavy-duty truck concept with a range of up to 350 kilometers. The truck – named E-FUSO Vision One – marks the top end of the electrification path of the company’s portfolio for the near future. This initiative will be backed by access to Daimler know-how in the fields of battery and charging technology, supporting the E-FUSO position as the frontrunner in electric trucking. 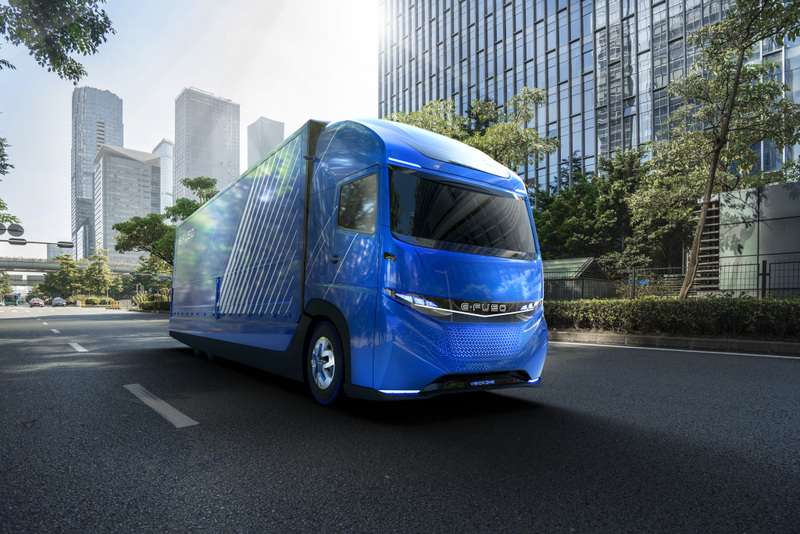 The E-FUSO Vision One is an all-electric heavy-duty truck concept, has a Gross Vehicle Weight (GVW) of about 23 tonnes and carries a payload of approx 11 tonnes, only two tonnes less than its diesel counterpart. It can be fitted with batteries delivering up to 300 kilowatt hours, thus enabling a range of up to 350 km on a single charge. While the electrification of long-haul trucks will still need considerable time, a potential application for the Vision One heavy-duty truck is regional intra-city distribution. Given the fact that growing customer interest, infrastructure development and regulatory efforts are likely to spur the electrification of road transport, a possible market entry for the series version of the E-FUSO Vision One could be feasible within four years in mature markets like Japan, Europe or the USA.